We’d love your help. Let us know what’s wrong with this preview of On the Razor's Edge by Michael Flynn. The secret war among the Shadows of the Name is escalating, and there are hints that it is not so secret as the Shadows had thought. The scarred man, Donovan buigh, half honored guest and half prisoner, is carried deeper into the Confederation, all the way to Holy Terra herself, to help plan the rebel assault on the Secret City. If he does not soon remember the key informa The secret war among the Shadows of the Name is escalating, and there are hints that it is not so secret as the Shadows had thought. The scarred man, Donovan buigh, half honored guest and half prisoner, is carried deeper into the Confederation, all the way to Holy Terra herself, to help plan the rebel assault on the Secret City. If he does not soon remember the key information locked inside his fractured mind, his rebel friends may resort to torture to pull it from his subconscious. 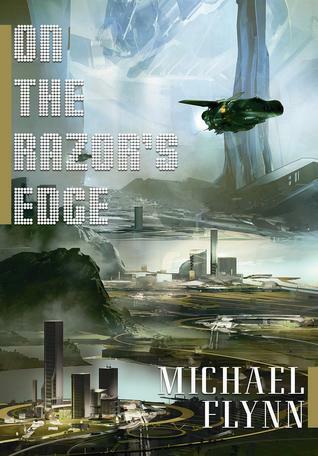 To ask other readers questions about On the Razor's Edge, please sign up. I bought this at a library sale, not knowing it is the fouth in a series. Why couldn't it say that somewhere on the cover? Anyway, Can I read this without reading the other books? On the Razor's Edge is the fourth book in Flynn's Spiral Arm series. It picks up right where In the Lion's Mouth ended. Bridget ban's daughter, Mearana the Harper, has left with the Shadow Ravn Olafsdottr and headed into the Confederacy. It is unclear whether she was kidnapped or went willingly. Bridget and a team of Hounds that she persuades to join her head into the Confederacy (and toward Old Earth) in pursuit. They all know that they are being lured into a war between the "Shadows of Name" an On the Razor's Edge is the fourth book in Flynn's Spiral Arm series. It picks up right where In the Lion's Mouth ended. Bridget ban's daughter, Mearana the Harper, has left with the Shadow Ravn Olafsdottr and headed into the Confederacy. It is unclear whether she was kidnapped or went willingly. Bridget and a team of Hounds that she persuades to join her head into the Confederacy (and toward Old Earth) in pursuit. They all know that they are being lured into a war between the "Shadows of Name" and that some of their number may not return. However, Mearana must be rescued and there is rumored treasure in the form of ancient artifacts/information -- it must be done. Meanwhile Mearan's father, Donovan buigh the scarred man, is being held in wily old Gidula's stronghold on old Earth. Donovan has his own tight path to walk. He fears that if he gives Gidula the knowledge of how to enter the Secret City he will not survive long; so, he has to play Gidula along while he gathers his own resources. From that start intrigues pile upon each other. Donovan goes on a journey of discovery on Old Earth. The conflict widens into a full war between the Names and their Shadows, with Bridget ban and her Hounds, Donovan, and Mearana adding extra random factors. The conflict becomes something I can only describe as a Ninja war with high-tech weapons. This is a satisfying end to the series. Although you could read this story on its on, I would recommend reading the first three books first. The author is clearly very talented. Much of the writing was enjoyable in an almost literary style, with much reference to bygone cultures, both real and fictional. I liked the character Donovan the best, with his multiple internal voices and the fact that he is in captivity at the beginning, and his enemy still continuously underestimates him. The plot is surprising, interesting, and flows good enough that most of the time I knew what was going on. I will say that there was a TON of name droppi The author is clearly very talented. Much of the writing was enjoyable in an almost literary style, with much reference to bygone cultures, both real and fictional. I liked the character Donovan the best, with his multiple internal voices and the fact that he is in captivity at the beginning, and his enemy still continuously underestimates him. I will say that there was a TON of name dropping, much of which seemed extraneous to the plot. The constant mentions of various cultures and languages, and pithy statements were so numerous that by the end I was rather sick of it. I think the author should use these devices more sparingly, and avoid so many unfamiliar terms that really are not necessary to the plot. Flynn really is amazing! I love his civilization drift here... His vision of the far FAR future is simply mesmerizing. I hope for many more novels in this series. "Until we know that Schrödinger has cut the thread, all possibilities remain open!" Debated whether this book was a three or a four, but finally went for three. It was a little dull in the early going and needlessly complicated during the climatic sequence. I didn't enjoy it as much as the rest of the series, but it was still an entertaining read. Really perfect ending for great story. Enjoyed reading it! The fourth of the Spiral Arm series. It's not a work divided up into four chunks, but the weight of the series before does supply more to this work. Also, there will be spoilers ahead for the first three. It opens with three, as the opening line observes. First there is Bridget, who summoned together such Hounds as her message could reach. She tells them she summoned them for her daughter, and then that this is because a Shadow of the Confederacy spirited her away. She carefully omits that this w The fourth of the Spiral Arm series. It's not a work divided up into four chunks, but the weight of the series before does supply more to this work. Also, there will be spoilers ahead for the first three. It opens with three, as the opening line observes. First there is Bridget, who summoned together such Hounds as her message could reach. She tells them she summoned them for her daughter, and then that this is because a Shadow of the Confederacy spirited her away. She carefully omits that this was probably voluntary on Mearana's part. But she gets allies to leave the League going after her. And second, there is Mearana herself, traveling with Ravn Olafsdottr, to lure her mother after her, because her father is prisoner in the Confederacy, and her mother would not come for her. She learns more and more about the place, and the conflict among Shadows that resulted in her father's first kidnapping. And third, there is Donovan, Gidula's prisoner. He learns how he came to survive, more about the struggle, and Gidula's principles of government. He knows Gidula wants him because of Padaborn's Rising, and the secret way out of the Secret City that saved him. He learns that many of Gidula's subordinates, even his magpies, are loyal to Padaborn -- and suspects that he wanted Donovan more troubled than he is, to dash their hopes. Gidula sets up a pasdarm, a mock combat, and Donavan guesses it to be a way to accidentally cripple him; he uses it instead to win over the man who was to do it. And intrigues thicken from there, and conflict, thicken from there. After all the revelations of the first three, it's amazing how many more can spring, completely naturally, from the events of this and them, without even making the past look over-crowded with events. Donovan discovers many things about Terra's past. This is the fourth novel in the Spiral Arm series, which started with ‘The January Dancer’. In the first book we learn about several fractions having a ‘cold war’. In the sequels we follow a group of people who are involved by their liaisons to these factions. Where ‘The January Dancer’s’ plot is about an alien artifact and its mysterious powers, the other books of the series are about people. In ‘Up Jim River’ we follow the story of Méarana and Donovan buigh in the rescue of her mother Bridget This is the fourth novel in the Spiral Arm series, which started with ‘The January Dancer’. In the first book we learn about several fractions having a ‘cold war’. In the sequels we follow a group of people who are involved by their liaisons to these factions. Where ‘The January Dancer’s’ plot is about an alien artifact and its mysterious powers, the other books of the series are about people. In ‘Up Jim River’ we follow the story of Méarana and Donovan buigh in the rescue of her mother Bridget ban. Following ‘In the Lion’s Mouth’ we find out why Donovan (Méarana’s father) abandoned Bridget and her daughter. ‘On the razor’s Edge’ brings together all lose ends. The story is told from different points of view. It gives us an intriguing picture of how the battling factions are plotting their actions. One may wonder what happened to ‘The January Dancer’ and its ancient creators. Or why there is so much struggle for power… For what? In the end all pieces fall together. And what is left over may seem very small compared to the vastness of the universe… Yet something to cherish! This is the 4th and final book in a series. I have not changed my opinion since I reviewed In the Lion’s Mouth, this book also did not stand alone well. I suggest reading the previous three , The January Dancer and then Up Jim River and then In the Lion’s Mouth before reading this book. Donovan, the protagonist, is still the key piece in the Spiral Arm politics. The black ops teams of the Confederation and the League each hope to use him for their own ends. I guess I should have taken my own advice and gone back and read the first two volumes. I like continuity and without those two books I could never find it. Just as in In the Lion’s Mouth, I was never able to get into this book. I like back story and find myself getting frustrated when I can’t put something in context. Flynn does write with great imagination and flair with super detail on the characters. They have colorful nuances that make them engaging. The Hounds and the Names still contend with Donavan’s personalities and I still end up confused. One thing is certain, an undeclared war may be more vicious than a declared war. I recommend reading these four books in order. I think that, in order, they will be much more enjoyable. I'm not sure if my lackluster opinion of this book is the result of jumping into the series at the end (I didn't realize it was part of a series when I picked it up), or if it really was just a dull book. I felt the science fiction/fantasy blend was poorly done. The world is full of space ships and interplanetary travel, but the style of writing was high fantasy poetry. Throw in most of the characters having Scottish accents, and I just couldn't suspend my disbelief for this book. I didn't sense I'm not sure if my lackluster opinion of this book is the result of jumping into the series at the end (I didn't realize it was part of a series when I picked it up), or if it really was just a dull book. I felt the science fiction/fantasy blend was poorly done. The world is full of space ships and interplanetary travel, but the style of writing was high fantasy poetry. Throw in most of the characters having Scottish accents, and I just couldn't suspend my disbelief for this book. I didn't sense any genuine feelings between the characters, their interactions spoke mostly of obligation and habit. The plot itself didn't grab me, and while the story moved quickly I didn't feel anything particularly special about it. I still don't know why I enjoy this series so much, but I do. This one had a lot more spy/intrigue/triple-crossing kinds of things. There's still way too many fights between people who are way too superhuman. The disguises and such are also superhumanly amazing but somehow that doesn't bother me as much. Maybe I just really love the world, the future, the attitudes about humanity's Terran origins. Or the poetic writing style? Or the plot and the way it alternates between slow seeking and fast-paced I still don't know why I enjoy this series so much, but I do. Maybe I just really love the world, the future, the attitudes about humanity's Terran origins. Or the poetic writing style? Or the plot and the way it alternates between slow seeking and fast-paced combat scenes. The book is the final chapter in loosely held together series known as as the Spiral arm. It resolves the main mystery running through out the series who is the scarred man who who created him for what purpose. The story is another quest for the holy grail book, with all the attendant battles battles seances. If you like this sort of book then this story will appeal to you. The book and series suffer from its use of ancient language and archaic forms of modern words. This use distracts from the s The book is the final chapter in loosely held together series known as as the Spiral arm. It resolves the main mystery running through out the series who is the scarred man who who created him for what purpose. The story is another quest for the holy grail book, with all the attendant battles battles seances. If you like this sort of book then this story will appeal to you. A continuation on the other books in the serious, Flynn delights in trying to imagine worlds in which the honor caste system of the 14th century could be adapted to help run interstellar governments. Reveling any more would be spoiling the many twists and turns in the story, particularly on who is double crossing whom….. This is virtually unreadable with Celtic and other speaking styles replicated in dialogue and a plot that moves with the pace of a constipated snail. Fourth book in this tired series. I enjoyed the first two books but the last two limped (hopefully) to the finish line. Just not a lot going on in this one, and too many characters to really care about. Librarian Note: There is more than one author in the GoodReads database with this name. Please see this page for the list of authors. Michael Francis Flynn (born 1947) is an American statistician and science fiction author. Nearly all of Flynn's work falls under the category of hard science fiction, although his treatment of it can be unusual since he has applied the rigor of hard science fiction t Librarian Note: There is more than one author in the GoodReads database with this name. Please see this page for the list of authors. Michael Francis Flynn (born 1947) is an American statistician and science fiction author. Nearly all of Flynn's work falls under the category of hard science fiction, although his treatment of it can be unusual since he has applied the rigor of hard science fiction to "softer" sciences such as sociology in works such as In the Country of the Blind. Much of his short fiction has appeared in Analog Science Fiction and Fact.